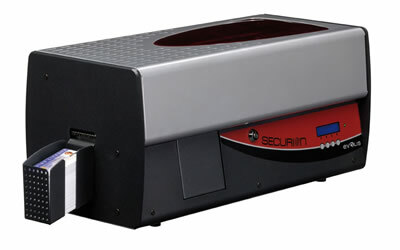 Securion - ACE Peripherals ::: Completing I.T. A protection film is applied over the surface with hot roller technology, after the graphical and electrical personalization process. The film is either a continuous layer of varnish or a patch. Editing and encoding a secure badge is just a matter of a single pass. Encoding options: magnetic stripes, contact and contactless SMART cards. Encoding options for magnetic stripes, smart cards and contactless cards (all options can be combined in a same printer). 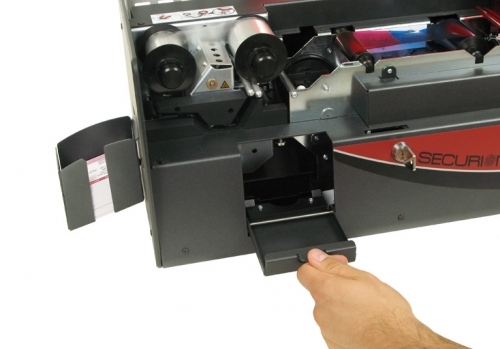 A centralized locking system to prevent theft of films, patches, rejected badges or blank cards. Securion can be password protected, if this option is enabled in the software. Only authorized staff can then use the printer. 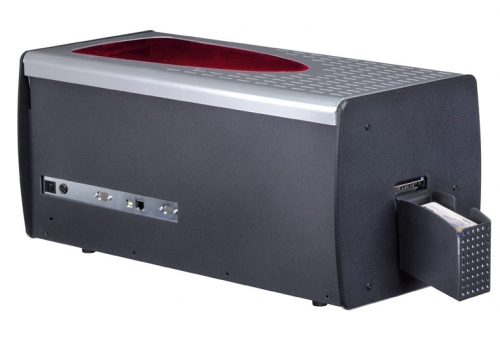 The frame and the stand are of metal to increase the lifespan of the printer and to fight any intrusion attempt. A 2-year warranty (printer and lamination station), limited to 100,000 inserted cards for the print head and the heating roller. A 2-line LCD screen displays the status of the printer and of the lamination station. The menu offers direct access to a range of settings and data related to the operation and maintenance of the printer. A two-color LED provides instant notification on the printer status: green indicates normal operation, red indicates an alert or error. Standard USB and Ethernet ports. 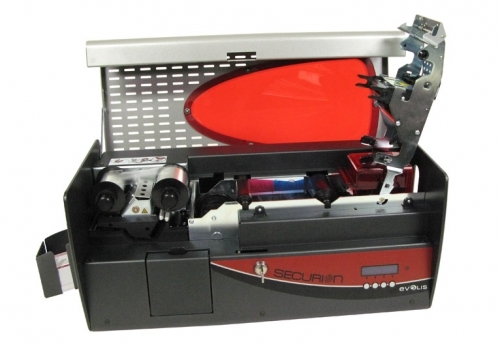 Securion includes equipment and feature in its standard version that are offered as options by the competition (Ethernet port, lock, eject tray, 100-card feeder and tray, 2-line LCD screen…). Securion can apply 1.0 mil lamination patches on standard PVC (single-sided lamination) cards, which cuts the cost per card by approximately 10%.